Indium tin oxide (ITO) thin films prepared by the sol–gel method have been deposited by the dip-coating process on silica substrates. CO2 laser is used for annealing treatments. The electrical resistivity of sol–gel-derived ITO thin films decreased following crystallization after exposure to CO2 laser beam. 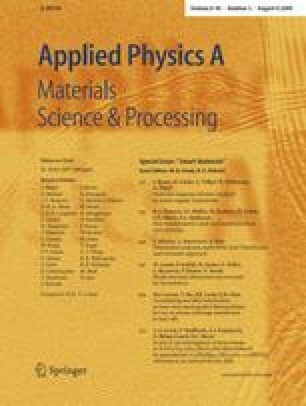 The topological and electrical properties of the irradiated surfaces have been demonstrated to be strongly related to the coating solution and to the laser processing parameters. Optimal results have been obtained for 5 dip-coating layers film from 0.4 mol/l solution irradiated by 0.6 W/m2 laser power density. In this case, homogeneous and optically transparent traces were obtained with a measured sheet resistance of 1.46×102 Ω/□.